Edo Livelihoods by Hokusai presents works from our collection by Hokusai and his students that depict the many ways people made their living in Edo. Their livelihoods include types of work that are no longer familiar as well others that are the roots of commerce today. 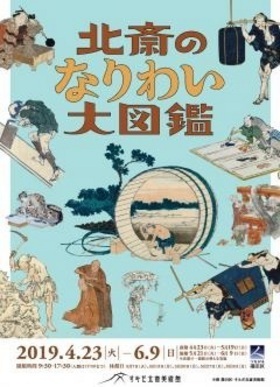 Hokusai portrayed people engaged in many kinds of work. Indeed, Hokusai’s brush, which painted a multitude of subjects, vividly communicates how people worked in his day. This exhibition is organized in six sections: 1. Selling Things, 2. Harvesting the Blessings of Nature, 3. Giving People Pleasure, 4. Transporting Things, 5. Making Things, and 6. Miscellaneous Livelihoods. The first section introduces a variety of merchants, including peddlers and bear balm vendors. The second introduces fishermen, loggers, and others whose work consists of harvesting resources from the natural world. The third section introduces the Edo's entertainer such as Kabuki actors and street performers. The fourth section addresses the transport industry, with its express messengers, sedan-chair bearers, and others. The fifth section presents coopers, painters, and other Edo artisans. The sixth section introduces a miscellany, from physicians to waste paper buyers. Focusing on everyday work brings the nature of society into view. Understanding the scenes depicted in his work enables Hokusai’s images to speak to us in greater detail about the lifestyles of people in Hokusai’s day. Please enjoy exploring Edo Livelihoods by Hokusai in detail. We would like to express our profound respect for and gratitude to everyone whose cooperation and support helped make this exhibition possible.